HOLLYWOOD, Calif. – Take the ultimate journey into the unknown with the heart-pounding sci-fi thriller THE CLOVERFIELD PARADOX, arriving on Blu-ray and DVD February 5, 2019 from Paramount Home Media Distribution. Featuring over 25 minutes of never-before-seen bonus content including behind-the-scenes interviews with the cast and crew, THE CLOVERFIELD PARADOX Blu-ray and DVD are must-own discs for your collection. The film will also be available as part of the new Cloverfield 3-Movie Collection on Blu-ray and DVD. 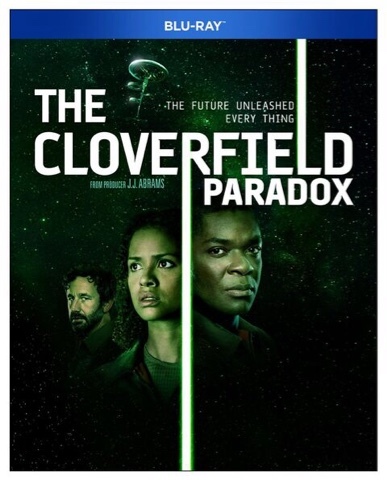 The third film in producer J.J. Abrams’ thrillingCloverfield franchise, THE CLOVERFIELD PARADOX follows a group of scientists orbiting Earth on the brink of a devastating energy war. They prepare to test a device that could provide unlimited power…or trap them in a terrifying alternate reality. The film features a sensational international cast including Daniel Brühl (Captain America: Civil War), Elizabeth Debicki (Guardians of the Galaxy Vol. 2), Aksel Hennie (Hercules), Gugu Mbatha-Raw (A Wrinkle in Time), Chris O’Dowd (“Get Shorty”), John Ortiz (Silver Linings Playbook), David Oyelowo (Selma), and Ziyi Zhang (Crouching Tiger, Hidden Dragon). The Blu-ray is presented in 1080p high definition with English Dolby Atmos®*, French 5.1 Dolby Audio™, Spanish 5.1 Dolby Audio, Portuguese 5.1 Dolby Audio, and English Audio Description and English, English SDH, French, Spanish, and Portuguese subtitles. The Dolby Atmos soundtrack was remixed specifically for the home to place and move audio anywhere in the room, including overhead. The DVD is presented in widescreen enhanced for 16:9 televisions with English 5.1 Dolby Audio, French 5.1 Dolby Audio, Spanish 5.1 Dolby Audio, and English Audio Description and English, French, and Spanish subtitles. Produced by J.J. ABRAMS, p.g.a. LINDSEY WEBER, p.g.a. Johnny English Strikes Again On January 8, 2019.